Disney has been trying to make a film out of The Snow Queen since the 1940s, and for the last seventy years, their best minds have puzzled over how to modernise the tale, and make its female characters "relatable". In the midst of their current craze for adjectives, they've finally cracked it with Frozen, a loose adaptation of Andersen's tale, which also kicks the studio's current revival up another notch. 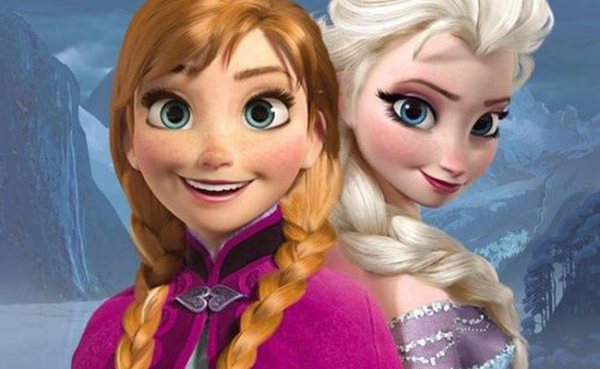 The film centres around two royal sisters, Elsa and Anna, the former of whom has the power to create ice and frost. When she nearly freezes Anna to death by accident, Elsa withdraws to her room, keeping herself hidden from the world and also shutting out her sister. Several years later, Elsa loses control on the day of her coronation as queen, shrouds her whole kingdom in an eternal winter and retreats to the wild. Despite a pending engagement, Anna immediately takes off on a quest to bring her back, determined to thaw both the kingdom and her long-lost sister. Early last year, I did a bit of a whistle-stop re-watch of Disney animations over the course of several months, for Double Take, (the podcast I used to host.) Perhaps the most notable "era" of Disney animation to my generation is the Disney Renaissance of the 1990s, characterised by its use of Broadway resources in creating big, showy musicals, led by colourful characters. Most of us grew up on Disney, but those were the our Disneys. What makes Frozen so special is not only its successful imitation of that style, but its sparky adaptation of that format to a modern context. The script, from Wreck-It Ralph's Jennifer Lee, is full of witty turns on the formula, without ever being as arch about it as other modern fairytale movies, like Shrek or Disney's own Tangled. The result seems very aware of things like irony and cynicism, but uses that awareness to beef up its own sincere and typically emotional approach. In addition to a script that is funny and unpredictable, (for Disney, anyway) there's an impressive songbook from Robert Lopez and Kristen Anderson-Lopez, the husband-and-wife composing team behind Broadway musicals like The Book of Mormon and Avenue Q. While you're watching it, it initially feels like the film lacks a standout catchy number like the best of these Disney musicals do, except that the songs are stuck in your head on hard rotation from the second you leave the cinema. With the exception of the sore-thumb pop number "Love Is An Open Door", they're all pretty good songs, delivered memorably. "Do You Want To Build A Snowman?" is a chirpy and poignant number that helps to show Anna's lonely childhood, and Idina Menzel brings the house down as Elsa with "Let It Go", a towering ballad that has the next Oscar for Best Original Song in the bag from the very first note. Because it's so unexpected in so many ways, I'm deliberately avoiding going into too much detail about the plot, but I admired the way in which the film is really about the two sisters in the centre. Anna is a more discomposed and klutzy Disney princess than we're used to, making for a likeable heroine, and if Elsa were in any other film, it would probably be X-Men. Both are strong female characters, set off nicely by some surprisingly grounded male counterparts- where the Prince Charming figures are normally characterless cutouts, Frozen's Hans and Kristoff each emerge with more recognisable personalities and motivations. I caught this at an advance screening, packed with families, and there's no better way to gauge just how effectively the film and its characters are landing with kids. On that measure, as well as many others, Olaf the snowman is going to be one of the most popular Disney characters of the modern era. 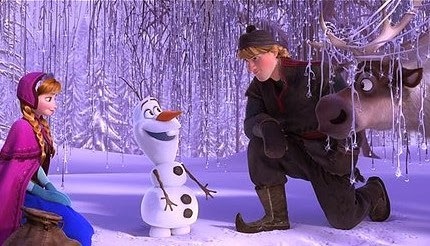 He pops in right on time, for a comic relief character, and proceeds to steal the show from there on out- the film's cheeky sensibility is best summed up by the irony of him being a snowman who likes warm hugs, and his much-celebrated and hilarious number about how much he's looking forward to the summer. Frozen is the most enjoyable animated film of the year, unfettered by the cynicism or try-hard tactics that steered Disney away from this type of film. It hasn't been focus-grouped within an inch of its life, in some vain hope of appealing to boys as well as girls, because just like The Little Mermaid and Beauty and the Beast, it just entertains consistently, and the audience follows. Disney animation has been going strong in recent years, but this one is especially good for making the princess/fairytale musical cool again, for the first time since before Shrek. As we look ahead to the end of the year, this is 2013's most pleasant surprise. Frozen is now showing, in 2D and 3D, at cinemas nationwide. 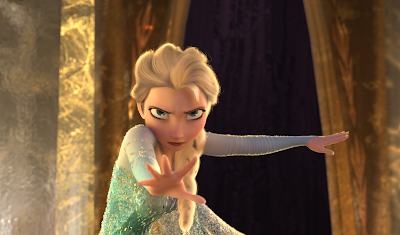 If you've seen Frozen, why not share your comments below? You can also read my (spoiler-free) interview with directors Chris Buck and Jennifer Lee, here.